How experienced are you at your chosen mode of travel? Do you know how much distance you can reasonably cover in a day? Have you been doing it long enough that you have dealt with a wide range of conditions and know how to deal with them? To maximise your chances of success (and ensure you get at least some enjoyment out of the expedition) you need to be confident and proficient at doing the sport you´ve chosen. A good level of fitness is important, although if the adventure is over many days or weeks then you will get more fit as you go – having good technique and being generally healthy is more important. Can you get help from locals? Calamities happen. The hazards we fell foul of included getting kites stuck up a tree or on powerlines, being trapped by the tide, or getting dragged thirty metres face first up a dune. Of course it could have been a lot worse. If the unintended happens, you either need some form of support (a vehicle / knowledgeable guide), or you need to be able to rely on locals to point you in the right direction. This involves speaking the language, or being confident that locals can speak your language (definitely not always the case especially in rural areas), or having very good miming skills! What if you don´t have answers to any of these questions? You can get away with having good answers to two of the above but have a good think if you can´t convincingly answer less than this. 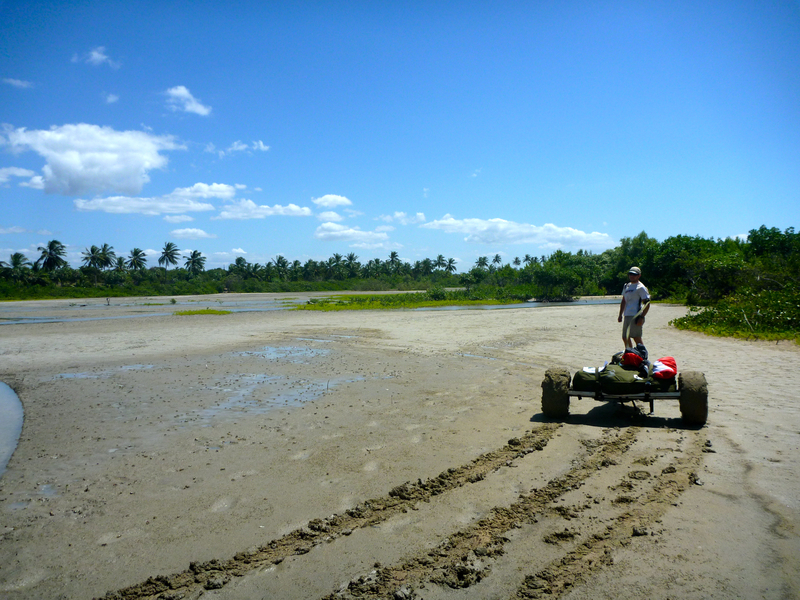 Looking back on it, before embarking on the kite buggy adventure we couldn´t answer a single one. Whilst we made it and had a lot of fun in the process, the journey didn´t go to plan and the challenges faced were probably greater than they needed to be. It all depends on how much risk you are prepared to take, and how much of a challenge you want. You will invariably develop and learn along the way, and in many ways that was the most satisfying aspect of our kite buggy adventure. The highs are very high, but there are plenty of lows too as you work out ways to overcome seemingly impassable challenges. For us, most of the obstacles were down to inexperience or lack of knowledge. As far as we know no one had tried long distance kite buggying in Brazil before. We had only just learnt to kite buggy. We had little knowledge of the local terrain or vehicle support. We didn´t speak Portuguese. Whilst our ability to kite buggy, our knowledge of the terrain, and our comprehension of Portuguese all improved as the journey progressed, the first couple of weeks were especially hard, and it was only in the last week that we really began to experience ´flow´ in what we were doing, as our ability and knowledge increased in line with the challenges. This entry was posted in Inspiration, Journal and tagged adventure planning, adventure travel, expedition planning, things you need to go on an adventure, three things you need to succeed in an adventure by Harry Thuillier. Bookmark the permalink. Good insight into adventure anywhere. The unknown is part of the reason we all do new things, if we had all the answers before we started why would you bother. Calculated risk is the excitement ratio in all adventures. Looks to me you’re having your fair share and I hope you have many more. We both wish we’d been with you; but we were to a point, in your blog, thanks. Nice post Harry. You clearly took a lot away from your trip. Here’s hoping it feeds into future plans!